We’re at Frstenfeldbruck airfield, a stone’s throw from the famous Munich Hofbrauhaus. We’re number three in a row of silver M5s, waiting to try out launch control, one of the many techno toys on BMW‘s latest bersedan. To get into LC mode, you need to select S for sequential, dial in the fastest of six shift speeds, deactivate stability control, push the shift lever forward, and hold it there. Now floor the throttle, wait until the tach needle hovers around 4000 rpm, release the lever, and brace yourself for a stunning launch. The BMW lifts its nose, squats on its haunches, and spins the rear tires in a relatively controlled mix of grip and blue-gray smoke. Before you can breathe out, the computer whips into second gear at 8250 rpm sharp, then third, fourth, fifth, sixth, and seventh. That’s right: seventh. This is the first car in the world to have a sequential manual transmission with seven forward ratios. About two-thirds of the way down the airstrip, the M5 closes us down at an indicated 168 mph. Although it could exceed 190 mph easily, BMW decided to stick to the German industry’s voluntary restriction of 155 mph, although the speedometer reads a bit optimistically. Against the stopwatch, the 500-horsepower M5 is in the same league as the Audi RS6 and the Mercedes-Benz E55 AMG, because the makers of all three quote a 0-to-62-mph time of 4.7 seconds, and all three bump up against the limiter at 155 mph. But the BMW is different, because it involves you and feels as if it was built by people with passion. Putting the M5 through its paces is a spine-tingling and pupil-widening experience. This is a high-performance five-seater that can be fine-tuned to meet individual preferences and driving styles. 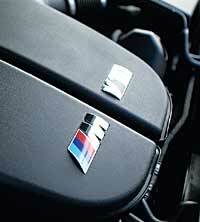 The new M5 invites you to calibrate the engine, transmission, steering, traction control, and damper characteristics. The 5.0-liter V-10 offers three performance programs: P400, P500, and P500 S, denoting 400, 500, and 500 horsepower in sync with an ultrasharp throttle action. The transmission wants to be told whether to operate in sequential or automatic mode and at which shift speed. The Servotronic steering can be quick or very quick. Stability control can be fully active at all times, set to allow a certain amount of tire slip, or switched off altogether. The EDC (electronic damping control) button chooses among three levels of suspension tautness: comfortable, normal, and sporty. The only bad news is that you access the systems via iDrive, the onboard mouse that will turn into a poisoned rat following a wrong twist or push. Although most options are individually accessible via buttons in the center console, P500S, Servotronic S, and dynamic traction control require deep dives into various submenus. Alternatively, you can store a feature on the star button in the multifunctional steering wheel. Right above it is the even more significant M button. Push it, and the power output automatically jumps to 500 horsepower, the skid control system (DSC) switches to M Dynamic Mode (MDM), EDC stiffens up the dampers, and Drivelogic sets your preferred shift speed. Then you can forget all the confusing secondary controls and concentrate on what matters: driving the socks off this truly awesome fourth-generation M5. Although it looks like a 545i on steroids, the M5 is plenty different beneath its gung-ho skin. 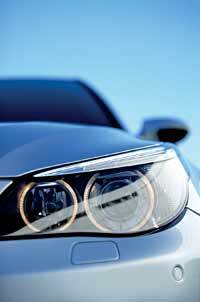 Vogueish innovations such as active steering, Dynamic Drive, ceramic disc brakes, and run-flat tires are absent. The two-stage Servotronic steering seems more involving than the Active Steering fitted to the regular 5-series and can be either relaxed and nicely weighted or immediate and very precise. In both modes, the power assistance is determined in relation to engine and road speed. Through the cones, this relatively conventional rack-and-pinion device is more fluent and better balanced overall, feels more positive and less artificial, and is beautifully progressive in terms of gearing and effort. We did not really miss Dynamic Drive, either. In the comfort setting, EDC occasionally struggles to keep body movements in check, but the tauter the damping, the flatter the cornering attitude, the more stable the chosen line, and the more immediate the feedback. Gerd Richter, technical director of the M division, describes the decision not to use composite brake discs: “Ceramic discs are lighter, but they cannot absorb as much heat as cast-iron rotors. This diverts the temperature stress to the calipers, which subsequently need to go up in size and weight, so you lose some of the initial advantage while at the same time further increasing the cost deficit.” Be that as it may, the ventilated and cross-drilled metal discs fitted to the new M5 are beyond reproach. Straddled by massive Teves two-piston calipers, they combine bite and stamina, low noise and smooth response. Even when they’re pushed to the limit, all one notices is a whiff of parfum de pad and a pit-stop-like cloud of dark dust rising from the front wheels as the vehicle comes to a halt. You will be pleased to hear that wear can be easily induced at the other end of the car, too. As soon as DSC takes a rest, the bespoke Z-rated nineteen-inch tires work overtime. In the dry, there is full-throttle wheel spin in first (unlimited), second (plenty), and third gear (enough to change the color of your hair in the middle of a fast bend). The second-generation Continental SportContacts developed especially for this car blend narrow slip angles-vital for precise turn-in-with a creamy breakaway. Like every iteration of the SMG theme, this latest version eclipses its predecessors. But, also like the others, even the seven-speeder falls short in some departments. The most controversial issue concerns the shift paddles, which are attached to the steering wheel, not the steering column. This may be an advantage on racetracks such as the Nrburgring Nordschleife, where BMW does a lot of its testing, but it doesn’t work so well in real life, where you come across 90-degree corners and hairpin bends. As soon as you need to change your grip on the wheel, you no longer know where you are in relation to the silver flaps marked minus and plus. You can always rely on the shift lever, however, provided you remember to pull it back for downshifts and push it forward for upshifts. After two days and more than 300 miles in the new M5, we would vote for a pair of large fixed actuators. We would also encourage Richter and his team to further hone the automatic mode. This is the first M car that drives reasonably smoothly in the auto mode-but only as long as you stick to a rhythm that’s familiar to the SMG electronic brain. Unfortunately, the chips still struggle to cope with maneuvers such as sudden kickdowns or aborted overtaking at-tempts. For best results, choose a medium shift speed. Slow is valium, fast is jerky and abrupt. The new V-10 is a remarkable engine. BMW claims that the ten-cylinder configuration was inspired by its Formula 1 program, but one also could argue that it was inspired by the need to move the M5 and next year’s M6 coupe further upscale, to make room for the V-8-engined next-generation M3. The only oddity is that it comes in two horsepower configurations. When you turn the key, you have 400 horsepower. To access more grunt, you press Power or hit the M button. With the full 500 horsepower under your right hoof, top speed is unchanged, but it takes 0.7 second off the claimed 0-to-62-mph time and 3.6 seconds from the 0-to-125-mph figure (18.0 instead of 14.4 seconds). Richter says this was done for fuel-consumption reasons rather than for durability. He has a point. Our test car, which was pushed hard in P500 for nine-tenths of the way, returned a sobering 10 mpg. Like all M engines, the V-10 is a normally aspirated high-revving unit. Although redlined at 8250 rpm, it will briefly tolerate 8500 rpm during full-throttle upshifts. Although its 384 pound-feet is not much more torque than the old M5’s V-8 offered, 80 percent of that peak is available over a wide range of 5500 rpm. 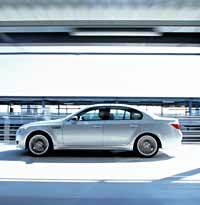 At 4035 pounds, the 2005 M5 weighs virtually the same as the model it replaces. Predictably, it adopts the same trademark design elements, such as ten-spoke alloy wheels, four chromed tailpipes, ellipsoid low-drag door mirrors, and sculptured ground-effect front and rear aprons that are designed to minimize lift. The only new styling features are the M-style gills in the front fenders. Inside are a pair of expertly executed metal-rimmed round instruments, a not-so-pretty steering wheel with voluminous spokes, and power-operated leather-trimmed sport seats with adjustable cushions, lumbar support, and side bolsters. A neat detail touch is the well-positioned head-up display. The driver faces a color-keyed sectored analog tach (green, orange, red), a gear indicator, and a digital speedometer. We don’t know what U.S. buyers will pay, but in Germany, the M5 sells for 86,200 euros (including the punitive VAT sales tax). We reckon it will be between $85,000 and $90,000 by the time it goes on sale in America toward the end of next year. In Europe, the new M5 is quite well equipped, but you still pay extra for a moonroof, adaptive cornering lights, and the navigation system, digital TV, phone, and CD changer. It’s likely that the moonroof and nav will be standard equipment for the United States. Extensive leather trim with either wood or aluminum accents also should be standard here. We spent the first hour in the car experimenting with and assessing the various settings. At the end of this learn-by-doing sequence, clear favorites emerged: engine in P500 (full power), EDC in normal, DSC in dynamic mode (MDM), and shift speed in the second-fastest setting. Switching DSC off altogether is OK if you want to be a hooligan for a while, but the dynamic mode beats it at curtailing understeer and permitting more than enough initial oversteer. Amazingly enough, you don’t have to rev the engine hard to enjoy it. You can trundle along at 60 mph in seventh to flow with traffic, but when you put your foot down at 1800 rpm in top gear, there won’t be any gulps or hiccups. At the same time, the V-10 has enough revs left at 150 mph to let you change down to sixth. While most comparable powerplants emphasize either power or torque, the V-10 plays both ends exceptionally well. As a result, its sweet spot ranges almost from standstill to top speed. There are virtually no dents in the torque curve and no deflections in the rpm ladder, there is no ratio too short or too long, and there is relentless dynamic and acoustic stimulation. The Audi RS6 was desirable because of its all-weather traction and almost irrational sensation of very high speed. The Mercedes E55 AMG has turbine-like grunt and soulless controls. The new M5, in contrast, is intuitive and involves the driver every step of the way. It is as stable as its rivals in a straight line, but its steering is lively and soulful. It is as fast through corners, but its handling is sublime and unambiguous. It is as strong on the brake and as energetic on the throttle, but it never forgets to generate feel and feedback. We said the same about the old M5, but this one has more raw speed and power and an even better-balanced chassis. The ride is more composed, with less body roll and understeer. It is more fluent, and there is a greater immediacy between input and reaction. The M5 could spell bad news for your driving license, but it’s guaranteed to brighten up the dullest day. Just about the only car that can rival it in terms of speed from A to B, smiles per miles, and everyday usability is the latest 911 Carrera S. The Porsche costs roughly the same money, and it may rank even higher in street cred, but the BMW offers five seats, a family-size trunk, and a less challenging attitude when pushed. This car is a sensible antidepressant, and it doesn’t even require a prescription-just a healthy bank balance. Also check out our 2006 BMW M5 wallpaper photo gallery.